and what i mean is that talent as we see it... shouldn't be limited to people we judge to beautiful. Even with those annoying episodes of tv shows where they have beautiful girls whose character is that of a no-brainer.. all looks and no brains.. is the other kind... she looks quite normal in a way.. so why should she be able to sing? I'm talking about Susan Boyle... and unless youve been under a rock for the last 2 weeks? you'd know who i was talking about. shes been called the next paul potts?!! even "paula potts" But I'm sorry, i think he is the next step up, perhaps it was just song choice.. I usually rush out when ET is on, the other day as i did i heard one of their stories coming up "Susan boyle and her new makeover". Something inside me groaned... something inside me thought "so shes pretty now? plastic surgery perhaps? already?!" 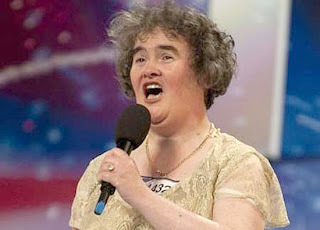 Susan Boyle is like so strange. Everything that I was going to say you've said it so yeah. Hmmm.. surprised I hadn't left a comment here yet! I had read it before. Speaking of which.. sometimes when you've told me that you've commented on one of my blog posts. it is true you have sometimes.. but you've put the comment in another post.. or have emailed it instead. Some of the time.. I mean. My apologies if I haven't mentioned that to you before. I've been saying to people I think Susan Boyle reminds me of "stage greats".. you know great stage/theatre performers.. with huge, wonderful voices. I wonder if she can act?